On this coming Friday, January 13th (the traditional feast of the Baptism of Our Lord) our newest blessing is going to be baptized by his Uncle, who will fly in for a quick overnight visit just for this occasion. Yesterday morning our oldest two daughters met with our local pastor and were given permission to receive their First Holy Communions (following their First Confessions) this week at the Traditional Latin Mass prior to the Baptism! It will be such a blessing for them not only to be able to receive these sacraments from one of their Uncles, but also during the Extraordinary Form of the Mass, which is rarely available in our area. They are both very excited! Thankfully Hubby has been off work for the past few weeks and was able to really work with the girls on a daily basis, making sure that they were prepared for these sacraments. 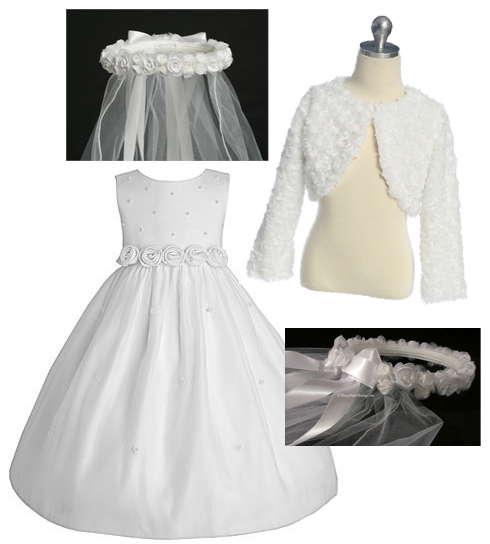 I on the other hand haven't had much free time, though I was able to find and order them some First Communion Dresses online and thought I would share them with you all. Aren't they pretty?! I purchased these dresses at the amazing price of just $24.99 each from JC Penney's the day after Christmas, thanks to a great sale along with the help of some bonus coupons! I would have liked to find dresses with sleeves, or have had time to add them, but instead I found a darling shrug/jacket for the girls to wear over the dresses. These were only $22.04 each, after signing up for emails and using the bonus 30% off coupon from Sophia's Style. I thought this jacket would be perfect for our cold January weather! These veils seemed to match the dresses nicely. We also liked that it had a nice long 30" veil, and how can you go wrong with roses!? Please keep the girls in your prayers this week, as they continue to prepare their souls to receive Our Lord for the very first time! How special for your girls, and what a sweet idea! I will be sure to save their veils for them. What an extra-special celebration it will be this weekend. We'll be praying! Your girls will look gorgeous Jessica. Prayers for them both this week. I love it all, but that jacket is soooo beautiful! It's going to be such a special day. The dress and shrug are lovely! What a blessing for both of them to be able to receive at the same time. A triple sacrament day, what could be more beautiful? We'll keep them in our prayers. What a wonderful blessing that will be for all 3 kids! I'm so excited for them. We had the unexpected opportunity to have our littlest blessing baptized at the vigil Mass for Epiphany. It went wonderfully. You mentioned the wedding dress idea...we created a Baptismal gown out of my MIL's wedding dress and it turned out beautifully. It's now been used for 3 Baptisms (soon to be 4) and 2 Christenings. It thrills her every time to see it worn. How exciting! I will definitely keep your girls in my prayers. beautiful and blessed. i will be certain to pray for your girls, baby, and uncle father. may all the graces that your family receive sustain you for the year. sparkles will be making her first communion in may. she begins instruction with fr. l this week. We have made both a small book and also (for a different girl) written on an artists canvas the girls name with "Will you pray for me?" and they got to take it people at their First Holy Communions/parties and people would write what prayers they promised the child. Our daughter loved asking for prayers and our guests loved praying for them. Congratulations! What a blessing!...and the dresses are beautiful! What beautiful dresses and veils! I still have my dress and veil - no daughters to pass it on to - but we had a tradition in our family that everyone got to go pick out their own dress and veil. My dear aunt, who has been gone many years now, was in charge of the First Communion Dress shopping trip. How she loved to take each girl in the family out for a special day before the great event. Will be praying on Friday for the girls and little Bud. I have a dear friend's birthday that day as well and a brother actually named Bud! Well, his name is Ralph but I couldn't say that and called him, "My Buddy." The nickname kind of stuck and everyone calls him Bud. Thank you so much for posting this - I'm looking for a dress for my oldest and this is perfect! I just ordered it. It's a great price too. Thank you and God bless you and your girls on their special day! What an amazing day it must have been. I was wondering how you decided to have both your daughters receive together. Is your younger daughter almost 7? I hope you don't take this as a criticism, I'm just truly curious as our parish seems to just have all the children receive in second grade and I look at my own 6 year old and know she isn't ready. But of course, each child is different! We have been wanting our girls to receive their First Holy Communions from one of their Uncles during the Extraordinary Form of the Mass (Latin Mass - which we don't have available locally). Twinkle Toes is on the older end of the age for receiving - she is currently 8 1/2 - and Chiquita will be 7 in 2 months. We were concerned that she wasn't ready yet, and both priests that quizzed her (our local pastor and her Uncle) said that she was just barely ready when they gave their permission. It will probably be quite some time before we would have had another opportunity like this.